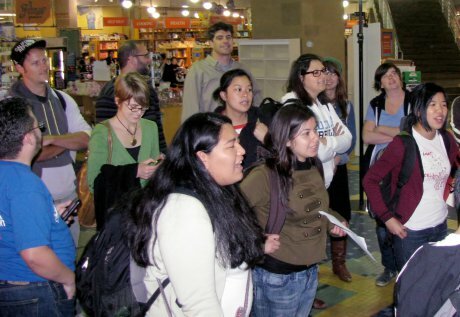 The UAW 2865, the union that represents 12,000 Teaching Assistants, Grad Student Instructors, Readers, and Tutors at the University of California, is extremely centralized. ** Nobody can so much as jump without the President authorizing the lifting of our feet off of the ground. The President has the authority to appoint people to any position within our Union. The appointee stays in their position until the next Vacancy Election. Why bother having an election, when the President can appoint their hand-picked choice? On February 3, 2011 the Election results were announced for our recent statewide Vacancy Election. The new Executive Board members are listed: Jeff Otter, Cheryl Deutsch, and Charlie Eaton. Yet, something curious happened – the UAW website (uaw2865.org) listed Filiberto Nolasco as “Guide-Elect,” though nobody actually ran for the empty Guide position (which, incidentally, Filiberto had vacated just a few weeks earlier). Filiberto recently confirmed that he was appointed to the Guide position by the President. The statewide Elections Committee, on which I sit as the UC Santa Cruz representative, wasn’t even notified of the decision. Also, at UC Irvine the Unit Chair was recently removed from his position by the President/E-Board for not attending Union meetings. Rather than hold a vacancy election to elect a new Unit Chair, and despite the protests of the reform-minded elected leadership at Irvine, the President of the Union insisted that somebody must be appointed. Our Union cannot claim to be democratic when the President has the power to appoint people to any position he/she pleases. Our union leadership can only be truly representative if the membership elects their own representatives. This should be obvious, and yet our leadership suppresses all efforts at reforming the Union to make it more democratic. It’s clear that a Union is only as strong as its membership is engaged and mobilized, and we cannot expect members to get involved in an unrepresentative, top-down union, one that sees it’s members as foot soldiers to carry out decisions made by a small group of distant people on the Executive Board. Academic Workers for a Democratic Unions is organizing to reform UAW 2865 – to empower members, to make our Union more democratic so that we can mobilize to defend our rights as workers at the University of California and join the larger struggle in defense of public education and social justice. A strong union is a democratic union. • All emails are vetted by the statewide President of the local – campus leadership don’t have access members’ emails. • All written materials and websites must be vetted by the President. Even campus leadership (head stewards, Recording Secretary, Unit Chair) aren’t allowed to create a flyer without it being edited and approved by the President of the Local. • All campus-based actions, events, and campaigns must be approved by the President, the Executive Board or the Joint Council. Dare to organize an unauthorized protest, and risk being yelled at by statewide leadership or removed from your elected position within the Union. • The Joint Council, which meets quarterly and consists of representatives from each UC campus represented by the UAW (so not UCSF), is controlled by the Executive Board, the President, and UAW International staff. They come to Joint Council meetings with a set agenda and a series of reports and essentially suppress most proposals they don’t suggest themselves. • Each campus leadership does not have automatic access to at least minimal funds to use to make flyers, buy refreshments, reserve rooms, etc. We can’t even buy a ream of colored paper without the President asking us to pledge not to use said paper for “unauthorized” petitions, flyers, or other literature. AFSCME is planning a solidarity rally in Sacramento this Tuesday, February 22nd. Vans or buses will hopefully be going from Berkeley in the afternoon, get in touch (berkeley@uaw2865.org) if you’re interested! 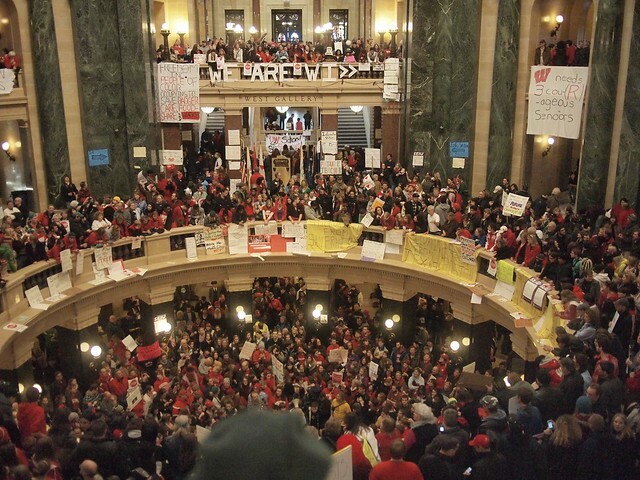 Amidst growing nationwide attempts to demonize public sector workers and their unions, Wisconsin has emerged this week as the first major battleground for the future of public sector unions. At least 30,000 workers and students have been out protesting in Madison for the last three days. The newly elected Republican Governor revealed his radically aggressive attack on workers’ rights last week. His plan would increase pension contributions from workers to almost 6% of pay, increase the percentage of health care premiums that workers pay to 12.6%, and drastically limit collective bargaining rights so that unions can only bargain over wages (not benefits or rights), must renegotiate contracts every year and must seek recognition from their members every year, and would no longer be able to collect dues through payroll deductions. It’s not hard to see that these measures would effectively destroy public sector unions, whose operating budgets would hugely increase as their ability to protect workers hugely decreases. Worse yet, faculty and staff at the University of Wisconsin would lose their rights to unionize completely–faculty just gained union recognition in 2009. As tens of thousands of public sector workers in Wisconsin turn Madison into Tahrir Square, I’m nagged by a question: How much of the current demonization of public workers is racialized? Yes, I get that this is plainly a budget debate: States are broke and the new surge of conservatives in governor’s offices and legislatures would far rather cut pensions and benefits than raise taxes. And those politicians have convinced many struggling constituents that it’s their own pocketbooks versus the paychecks of public servants. That tension is heightened by residents’ frustrations with public services that have been so hobbled in recent decades that they often no longer work well—like, say, public schools. I also get that, as many progressive commenters have noted, this is a straight out political fight. We’re witnessing the culmination of a decades’ long effort to destroy unions as the sole remaining check to corporate power in both federal and state government. Corporatists are plainly winning that fight, and the labor movement hasn’t always been its own best advocate. A Pew poll done in the first week of this month found public opinion of unions worse than it’s been in a quarter century—though, it found similarly historic lows for business. But as governors and columnists have painted pictures of overpaid, underworked public employee in recent weeks, I have also seen the faint outline of familiar caricatures—welfare queens, Cadillacs in the projects, Mexican freeloaders. It’s hard to escape the fact that, in the states and localities with the biggest budget crunches (New Jersey, California, New York…) public employees are uniquely black. The struggle over public resources, public sector work, and social services promises to be significant all over the US this year. There are some difficult strategic and analytical questions we need to be posing. All over the country, eyes are turned to the struggle in Wisconsin. The fightback has been inspiring, but it remains to be seen whether victory is possible, what victory would look like, and how developments there will set the stage for other struggles this year. UAW Local 2865 President Christine Petit (in green) checking her smartphone during a solidarity action. Busily ignoring member emails? By Sara Smith, Grad Student in History, UC Santa Cruz; Elections Committee Representative, UAW 2865 Santa Cruz. I’m the UC Santa Cruz representative to the statewide Elections Committee, the body tasked with overseeing our Union’s elections. About 99.9% of my emails to the chair(s) of the Elections Committee have gone unanswered, emails with important concerns and questions relating to our recent hotly contested contract ratification vote as well as what was predicted to be a hotly contested vacancy election. (The vacancy election, of course, became uncontested when the administration caucus of the UAW 2865, aka Executive Board and friends, pulled all of their candidates). Jennifer Tucker, formerly the Elections Rep at UC Berkeley and currently Unit Chair, had identical problems. Things got so bad that we’d regularly cc the entire Executive Board of the Union and sometimes even the entire Joint Council, in the hope that just maybe, at some point, we’d get somebody to reply! No such luck. This is not a problem that one or two people have had – it’s a systemic issue. Countless other UAW 2865 members I’ve spoken to have said it’s like pulling teeth to get the Union’s statewide leadership to reply to an email. We may even decide to create a special blog dedicated to all emails never responded to, emails lost in the abyss of our Union. Perhaps it goes without saying that this is a big problem – the lack of responsiveness to members’ emails by our Union’s leadership represent an insidious problem in our Union. A healthy, democratic, and thriving Union should have an elected leadership that is accessible, thereby accountable and transparent, so that all Union members can have confidence in our Union. The fact that Executive Board—particularly our Local’s president, Christine Petit—simply ignore members’ emails is just one more reason why we, Academic Workers for a Democratic Union, should vote them out of office during the May, 2011 Triennial election. *Christine Petit recently resigned from her position as President of the Local; now Daraka Larimore-Hall, UC Santa Barbara grad student, previously Northern Vice President (yes, he’s from a southern campus but represented northern campuses) is president.